We loved hosting Friendsgiving and ate leftovers for the entire week leading up to actual Thanksgiving. However, that didn’t hold back our appetites. Alex’s uncle Soo Hyun is a very talented chef and plans a gourmet menu for the occasion. This is what he spoiled us with this year. I baked two loaves of sourdough in the morning: one to eat with the cheeses, the other for sourdough stuffing. Everyone lent a hand, the entire dining table was set to the brim, and everything turned out so delicious! Then in keeping with tradition, we went to bed by 11PM and woke up at 5:30AM to hit the Camarillo Outlet Mall for some Black Friday deals. I bought more mature, business casual attire and am really trying to upgrade my wardrobe. On Saturday, we met up with Leslie and Matt at the Anaheim Packing District, and I finally checked out Morning Lavender boutique in Tustin. And then on Sunday, the gardeners returned to finish clearing the backyard. This weekend, we’ll be building our raised beds and planting new trees. We started planning our Friendsgiving feast a month ago, almost as soon as we returned from Bali. Léna, Rachel, and I planned the menu in a Google doc, giggling like crazy at our desks and assigning dishes. 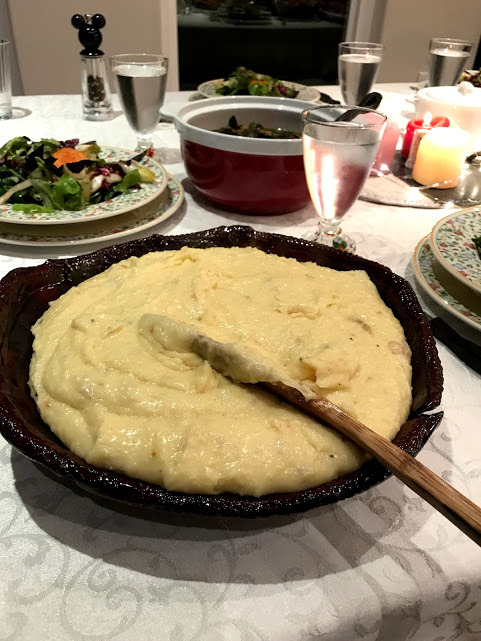 The idea was to introduce Léna and her husband Diaeddine to a true American Thanksgiving since they had never quite experienced one before. But then in the spirit of Thanksgiving, we expanded the invitation to our other friends from abroad, Ezequiel and Pastora, as well as other close friends like Arya and Daniel. In total, we had 10 hungry mouths to feed! The turkey was once again Alex’s pride and joy. We bought two huge turkeys from Costco a week ago (one for Friendsgiving, the other for actual Thanksgiving), conveniently avoiding the pre-holiday mad rush this past weekend. Two days prior, he carefully brined the bird with his special recipe, including salt, dried rosemary, thyme, and fresh oranges. When the day arrived, he spatchcocked the turkey and simmered the spine, neck, and giblets for 6+ hours to create a stock for the homemade gravy. Since the turkey was now butterflied, it only took about 2.5 hours to cook and stayed extremely moist and flavorful. We’ve been to our fair share of disappointing potlucks so we wanted to make sure every dish was made from scratch yet still easy. 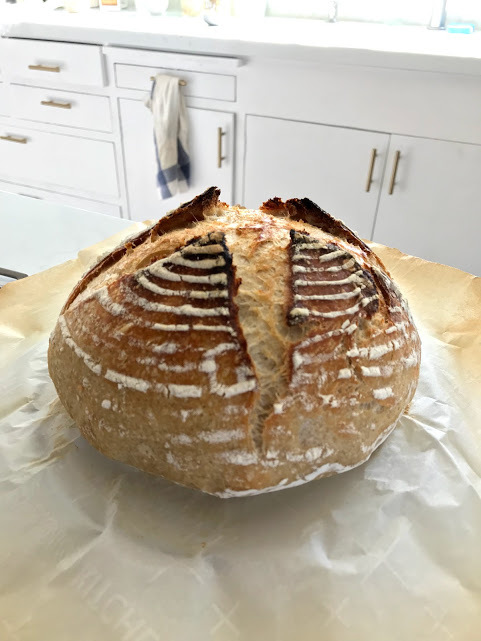 I had made it a personal goal to master sourdough by Thanksgiving, and indeed, I did with a few weeks to spare! I made two loaves: one to eat fresh with brie and the other to use in sourdough stuffing. Léna also brought additional decor to deck out the table and even generously gifted us a set of wine glasses so we’d always have plenty to host with. As our friends arrived, the kitchen island truly proved itself to be the heartbeat of our home. We’re so thankful that our open layout allows guests to move freely between the kitchen, dining room, and living room. It’s casual and comfortable, and we’re so proud of all the manual labor we put into painting the cabinets and designing it a year ago. The kitchen is our most used, and in my opinion, most loved room in the house and we’re so happy to share it with guests. It was a much-needed night of friendship, food, and laughter and we’re so thankful for everything this year has brought despite moments of hardship. Cheers to the official start of the holiday season! It took me five attempts to FINALLY achieve the perfect loaf! In my earlier attempts, my biggest issue was a deflated loaf. 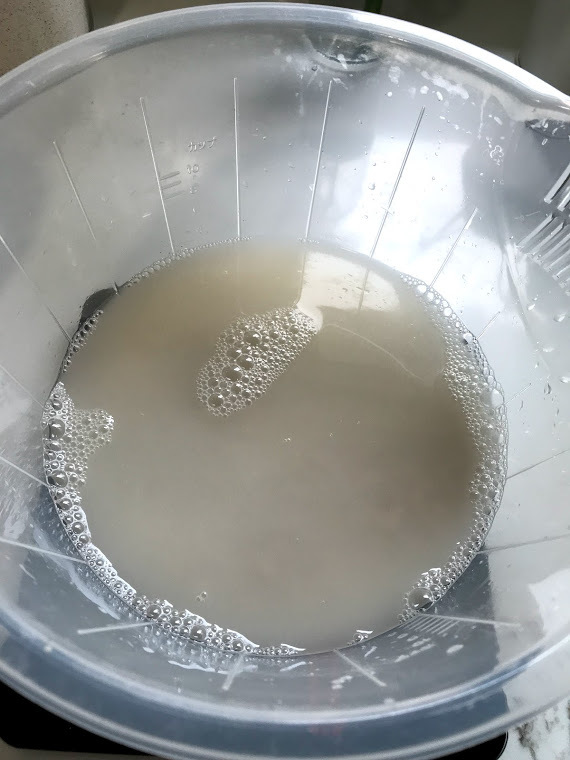 To increase the rise and produce more air bubbles, I adjusted my starter’s feeding schedule to twice a day and used warm water to help move along the process. I also had 3 starters going so I could track their progress and see which variables were most successful. The quality of these photos are pretty terrible because my hands were covered in flour. The starter with two daily feedings of rye flour was clearly the most lovely and bubbly and easily passed the float test. From there, I followed my usual recipe. Even though it does take time, I’ve perfected it now so that it fits comfortably into my schedule. 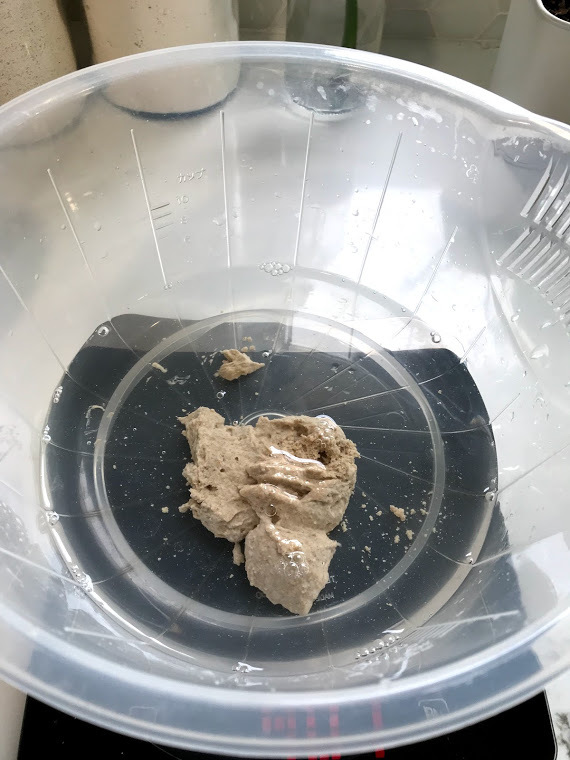 8:00AM: Mix 50g of sourdough starter with 350g warm water, 500g bread flour, and 9g salt. Cover with a damp towel and let sit for 30 mins. 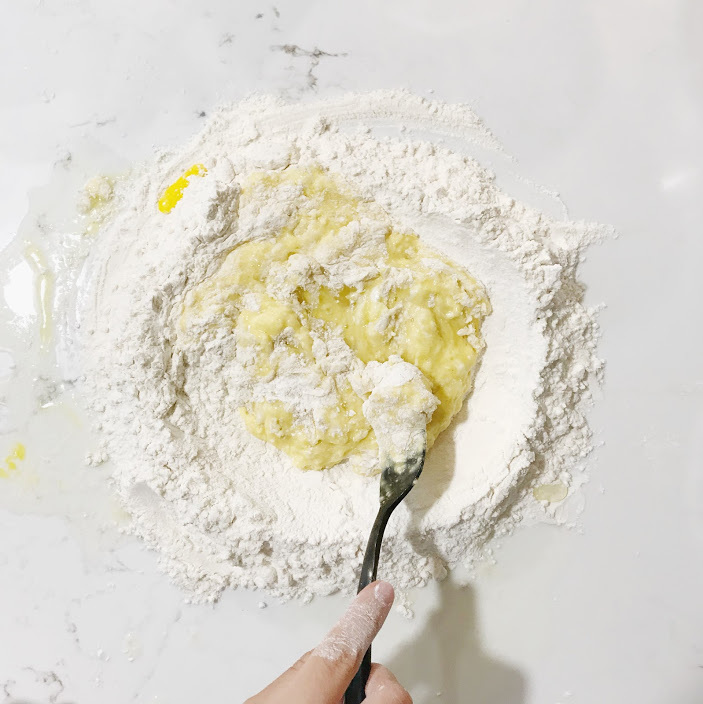 8:30AM: Fold dough inside the bowl towards the center to form a ball. Cover with a damp towel and let sit for 8-10 hours. Go to work. 7:00PM: Come home from work. 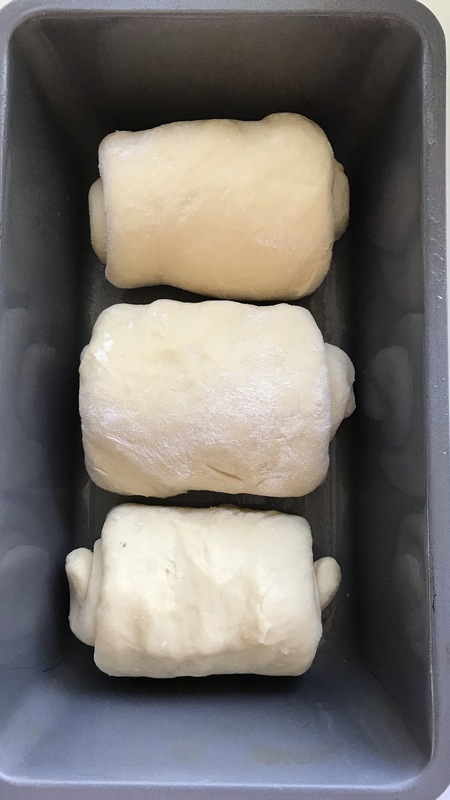 Gently roll dough onto the counter and fold the edges toward the center, forming a ball. Flip over so that the seam side is down. Cover with the bowl it was resting in and let sit for 5-10 mins. 7:30PM: Dust a banneton basket with flour. Rub hands with olive olive to prevent sticking. Roll and rotate the dough into a tight ball. This helps build its structure so that the bread will rise as it bakes. I usually shape it for a minute or two, until I see small hair bubbles stretching across the top of the dough ball. Place seam side up in the banneton, cover with a damp towel, and let rest for 30 mins - 1 hour. Eat dinner. 8:30PM: Pre-heat oven with the Le Creuset inside. Use oven mitts to remove from oven and open lid. Gently flip the dough ball onto parchment paper so that the seam side is down and gently lower into the Le Creuset. Cover lid and bake for 25 mins. 8:55PM: Remove lid and bake for 30 mins or until golden brown. 9:25PM: Remove from oven and let rest for 1 hour. 10:25PM: Slice bread and ENJOY. Recipe adapted from Baked: No-Knead Everyday Sourdough Bread. We spent another weekend cleaning and organizing, but it feels like we’ve barely made a dent. After Alex cut down the front trees last weekend, he put the chainsaw to good use again and finally cut down the overgrown bush in our backyard. It’s been bothering us ever since we saw the house for the first time. We also cleaned the guest room and rearranged the position of Alex’s desk. Now that he’s working from home, we invested in a standing desk and standing mat. The guest room has served as our storage closet ever since we got back from Bali, so we finally cleared my wedding dress off the bed and put our luggage in the garage. The other desk has been relocated to the foyer to serve as our charging station/“drop station” for keys and sunglasses, and display for our fancy ceramics from Gaya Ceramic in Ubud, Bali. I also found time to make two loaves of bread. You can read about them more here. And FINALLY, we put some of the cabinet doors back on. It’s taken us a while because some still need paint, others have missing screws, and there are been other priorities. Now that they’re back on the cabinets, our ongoing kitchen project is 80% complete since we started it last November. Can you tell that the dogs like to watch us as we putter around the house with our errands? So I tried again. Same recipe, longer proofing period, more bubbly starter, and parchment paper to keep the bottom from getting too crunchy. The flavor was still amazing, the crust still incredible, the texture still chewy, but the rise was still too deflated. And, you guessed it, I tried again. This time, with the proof in a plastic bowl and much more time spent shaping the dough to increase the surface tension. Definitely a little puffier, but I overworked the dough in my shaping attempt so the air bubbles deflated. The taste and crunch are still delicious though! I’m not going to give up on this recipe yet, but I’m thinking maybe I should use some packaged yeast to give it a little boost? I’m also going to consult the bread masters of Breadit. 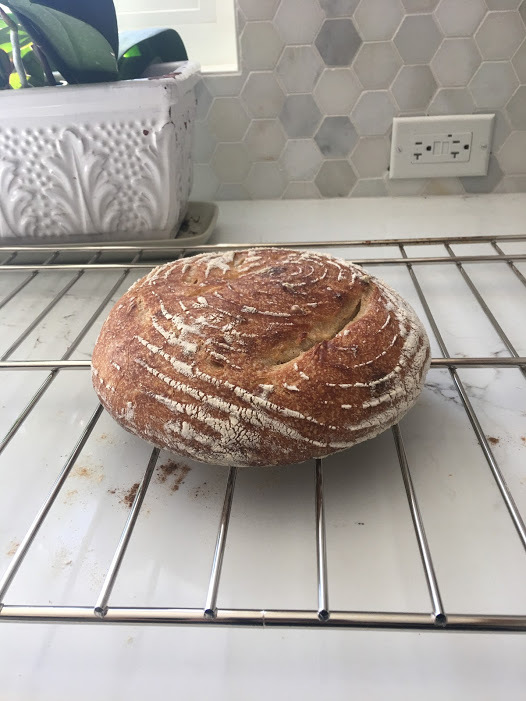 After my successful-ish first loaf of white bread, I decided to take on an intimidating challenge, far great than myself: sourdough bread. It’s been quite a process, and my loaf could use a lot more work, but the flavor and crust are spot-on. But first, the fails. 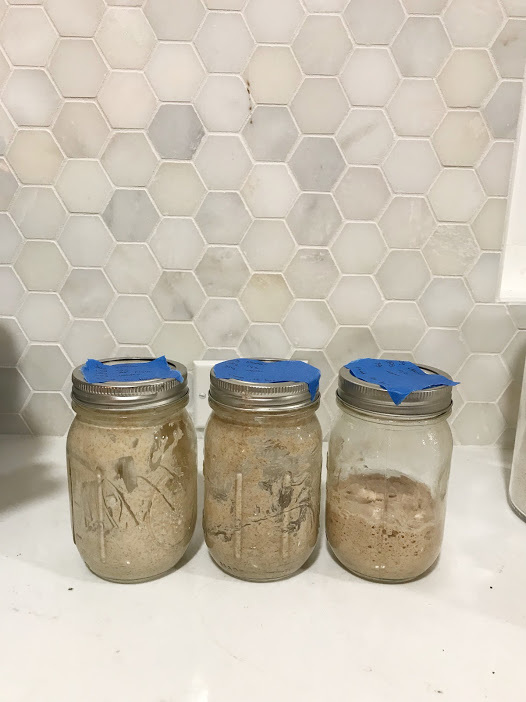 I absorbed myself in a very deep YouTube hole, watching lots of videos about sourdough starters and how to use the starter to make bread. Along the way, I became very aware (very quickly) of all the little details that could be misinterpreted along the way. 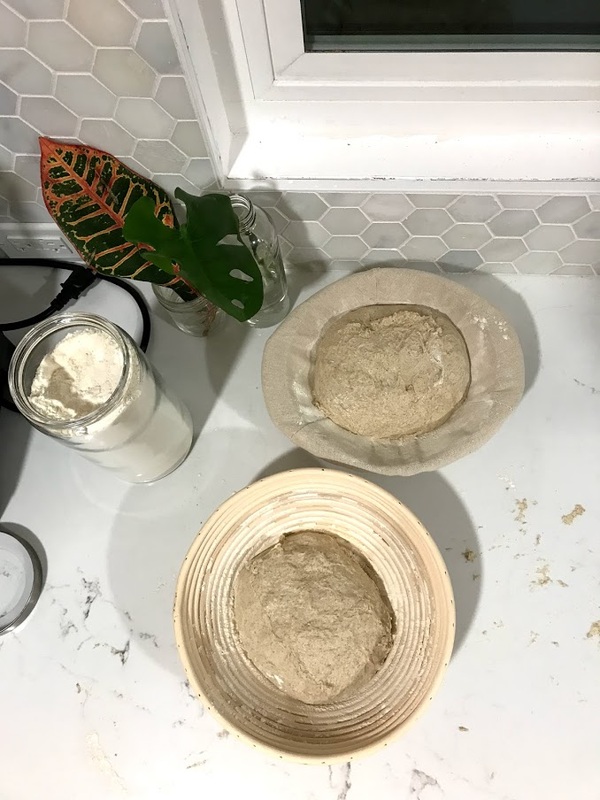 For example, I followed a recipe by The Kitchn for 5 days — weighing flour and water to feed my starter for 5 days. However, in her step-by-step, there is no mention of removing and discarding starter at every feeding. So, I followed what was written and just kept adding flour and water each day. Big mistake. My proportions were all wrong and although my starter was bubbly and sour-smelling, it lacked the proper consistency. I had to throw it all away and start over. The following week, I spent 7 days cultivating my starter using Joshua Weissman’s extremely helpful video. 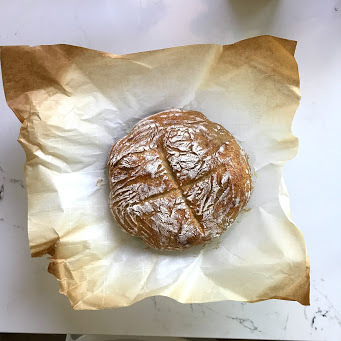 He makes the entire process approachable and easy to follow, and before I knew it, I was ready to attempt my first sourdough loaf using his amazing YouTube video. Like his timetable outlines, it took me the entire day plus another 4 hours the following day. It’s a very traditional recipe with many steps and moments of waiting in-between. The result was good, but dense. 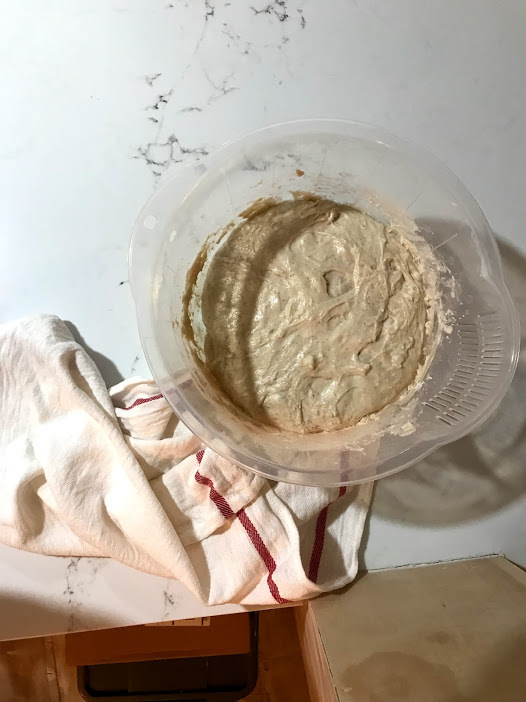 I suspect that my starter was not as active as it should have been, and our fridge was on the colder side for the overnight proof. It was a solid B+, but there was a lot of room for improvement. So I tried again! See my results in this post. We’ve been obsessed with the Great British Bake-off for quite some time now. 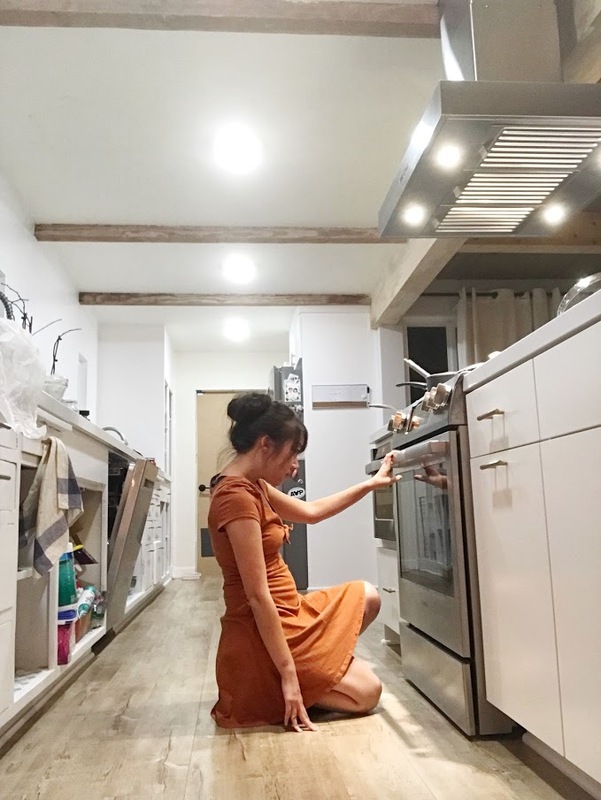 After watching all the warm and toasty morsels they’ve made, I knew I wanted to expand my baking skills and try baking some loaves of my very own. We recently received a Le Creuset from Alex’s Aunt Lena as a wedding gift. 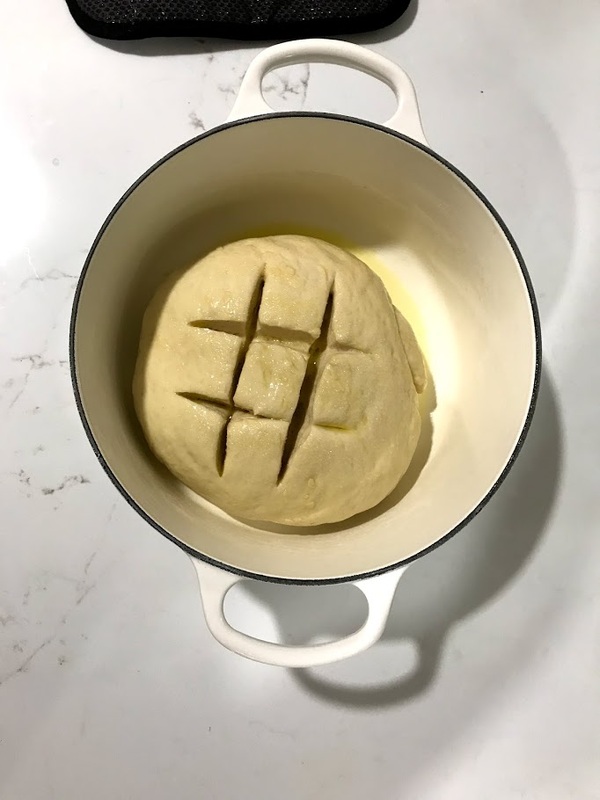 So when I saw the recipe for the Le Creuset bread with minimal kneading, I knew I needed it in my life. I borrowed Alex’s mom’s KitchenAid stand mixer and set to work on Sunday morning. 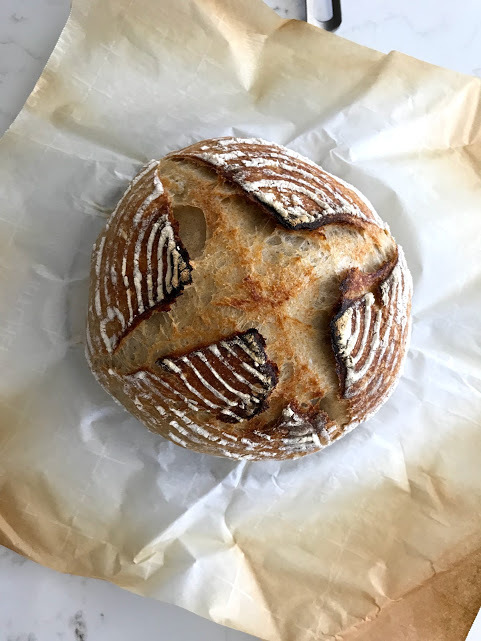 I had done lots and lots of research on Friday at work… watching YouTube videos of recipes like this one by Cutlery and More, reading blog posts like this one from The Kitchn about making a sourdough starter, and searching through photos of the most gorgeous baguettes. 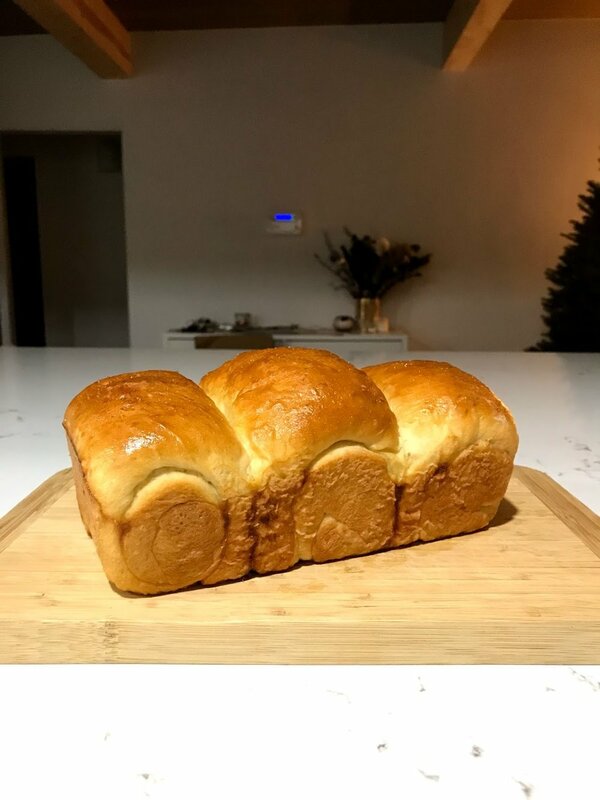 I decided to follow this recipe by Kitchen Joy because it seemed easy to follow and didn’t take over 24 hours to produce a final result. I mixed together 4 cups of bread flour, 1 tsp. of salt, 1 tsp. active dry yeast, and 1.5 cups of warm water in the KitchenAid. The ball of dough formed (although in retrospect, I should have mixed it longer). Then, in my frenzy of getting out the door to see our friends at noon, I totally messed up and left the dough to rise… in the fridge. BIG MISTAKE. When we came home almost 7 hours later, my dough didn’t double in size because the temperature slowed down the yeast. I took the dough ball out, rolled it around, and waited for it to reach room temperature. I also added a tablespoon of olive oil which gave the dough more elasticity and made it easier to roll. After I let it rest at room temperature for about an hour, I put it in the Le Creuset and prayed to the bread gods. Keep in mind, it was about 8:30PM on Sunday night so I was eager to start baking even though I knew I should have let it rest and rise longer. I baked it for 30 mins. with the lid on, then removed the lid and baked for another 30 mins. There’s definitely room for improvement, but like our homemade pasta, I’m so pleased with my first try. We’ve been eating a slice for breakfast every day this week and even toasting some with garlic and herbs to make croutons. 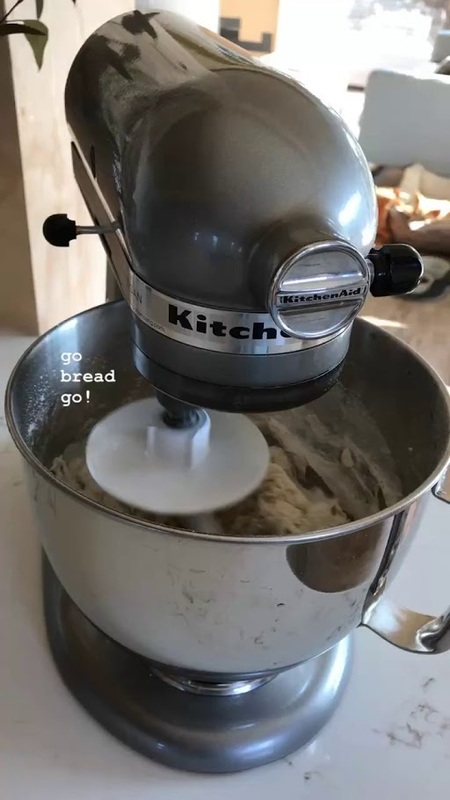 Knead dough longer. Potentially add 1-2 tablespoons of olive oil. On Friday night, our friends Adam and Katherine came over for our very first pasta night. We got the Marcato Atlas pasta maker from Crate & Barrel a week ago, and I was eager to try it out. We’ve only made pasta noodles once before so we didn’t really know what we were doing, but after doing some research on blogs, I was confident that we would figure it out with our foodie powers combined. I used the Williams Sonoma egg pasta recipe. I wanted to be legit and handmade, so I made a nest out of 2.5 cups of all-purpose flour and cracked 4 eggs in the center. 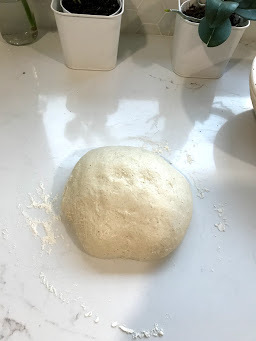 I beat it all together, forming the dough ball and letting it rest for 30 mins. 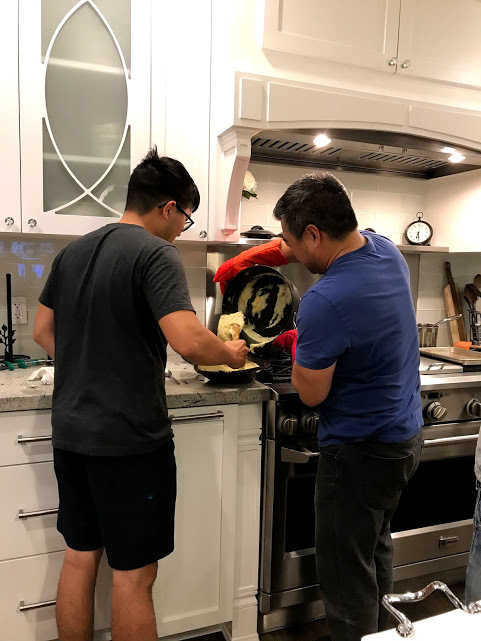 Then we followed the instructions on the pasta maker, rolling the dough into a thin sheet and cutting the noodles with the knob set to 6. We made two types of sauce: garlic butter (my favorite) and tomato basil. The noodles cooked for about 2 mins, and between the four of us, we actually ran out of noodles so we resorted to some dry packaged ones in our pantry. The texture of the noodles was very fresh, but a little bit doughy. Alex & I are dedicated meal planners and spend the majority of our time in the kitchen. We feel naked if we don't grocery shop over the weekend. We pack our lunches nearly every day, make breakfast together, and take pride in winging our cooking instead of following a recipe. So we've grown pretty attached to some of the items in our kitchen. Here are some of our not-so-secret favorites! My cast-iron skillet is my pride and joy. When I first started using it, it took forever to wash off scrambled eggs and cheese. But after a lot of TLC and many seared salmon filets later, the seasoning on my skillet is impeccable. Cleaning it is also super easy. I use sea salt to scrape off stubborn bits of food, rinse it, then place it back on the stove to evaporate the water. We just bought this aesthetically pleasing cold brew maker for coffee and tea, and we use it each day. 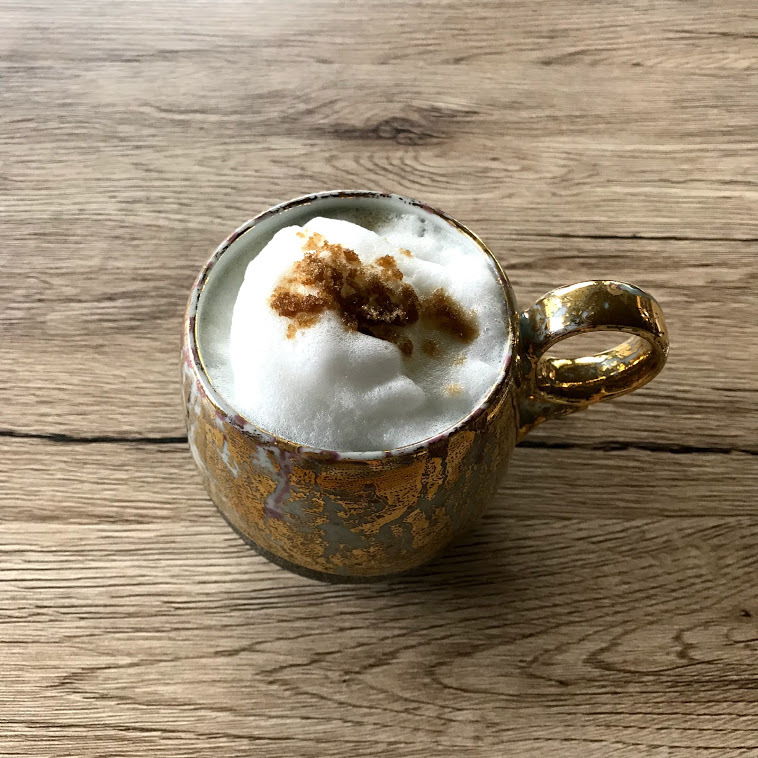 I'm terrible at making French press coffee, so this cold brew maker is a foolproof way to have strong, fresh coffee every morning with minimal effort. We got our Instant Pot just as the craze was beginning, and it's never let us down since. We use it to make rice, soup, porridge, hard-boiled eggs, stews... I've even made a cheesecake with it. In preparation for our wedding and getting our #BaliBod into shape, Alex has been juicing and I've been dumping the pulp in my compost bin. I bought this juicer after watching Fat, Sick, and Nearly Dead and it's great at handling tough veggies like carrots and beets. It's one of those little things you never knew you needed. I love making Chinese sauces with garlic, ginger, and green onion, and the microplane is perfect for shaving up the ginger. I'm also a big fan of lemons, and it adds the perfect amount of zest to dressings and dishes.